Omgosh, Kayla :( was this the one where the elderly siblings died? I've always been terrified or tornadoes, but after seeing the Moore damage up close, and going through the El Rio one in Oklahoma earlier this year, I'm more aware than ever of the power and danger. You stay safe, too, please. From what I've seen on local news, they haven't said who was dead in Brookport yet. But that could have been the one up in Northern IL near Peoria. I've had a fear of high winds / tornadoes since June 4, 1993 at about 10am. That was my first green sky moment that last 15-20 minutes and ended with no power for 5 days and trees on top of our house. Then in 2003, an F4 touched one mile past my parents place and one person I know was killed and many others lost their homes. So, yeah... I'm not a fan of anything with high winds when those storm lines kick out. Just now hearing the life flight helicopter overhead. I've seen some cross posts (friends of friends) on Facebook talking about injured and how some are being transported down to Vanderbilt in Nashville due to the severity of injuries. Three hospitals were overwhelmed (2 in Paducah and 1 in Metropolis) and then they set up triage in the town of Brookport itself. That is terrible. I'm so very sorry that they had to endure this. Nature's cruel at times. Nature is... 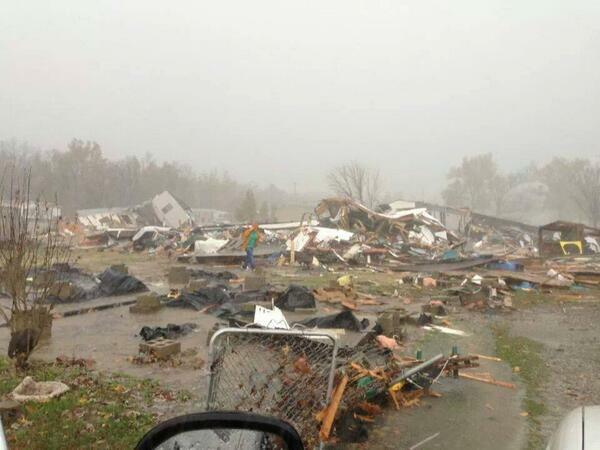 It's just so strange how this was only 4-5 miles from me and we have no damage. At the time this was happening, we actually weren't getting rain and the sun was shining on the other side of the clouds. The thunderstorm portion behind it hit us about 20 minutes later. And then it was rough for about 15 minutes where I couldn't even see anything beyond the house. Plan to pick up supplies that are needed tomorrow and take to a drop off point. my Prayers go out to all of the people who were affected by todays weather! Tornados are a special kind of scary for me for a looong time but this last year has been very bad. (HUGS) for all!! Never a good thing... I was sitting in my basement while this happened 4 miles away and we didn't even get rain at that point. The rain/wind didn't hit our place until about 20 minutes later and luckily it was just thunderstorm strength. The devastation is awful! Damage looks the same as the typhoon that hit Philippines. Trust you and yours are all ok. I'd be terrified of high winds too. I really thought the tornado period had finished for you folks, but obviously not. Tornado damage is always so bad in the area it hits. We can actually get tornadoes year round. There's just certain times where there more common. November is actually one of those times because we have such vary in temps as cold fronts come through. We were in the 70s (F) yesterday. When I walked outside to run to the store about an hour before the storm hit, you could just feel that something was not right and it was going to be bad. Wow! I had no idea. Yeah! November is a weird month here too, 10 days ago we were in the 80s (ºF) and now we're in the 50s, but fortunately we don't get any "dramatic" weather, just the occasional sea tornado in summer and no way as damaging or as strong as your tornadoes. Just watched the video it was terrifying. Where that barge was sitting is about 3 miles due west from my house. We really dodged a bullet on my side of the river. The video is also good because there are many that believe tornadoes won't cross rivers/lakes. In fact, they can and do. This particular tornado actually crossed the Ohio River twice. It started in Kentucky crossed to Illinois where it hit Brookport and then crossed back to Kentucky where it weakened as it Smithland, Kentucky not as bas as Brookport. I had just pulled up in the driveway with my groceries when the tornado sirens went off. So glad I had baled out of Walmart before it hit. Instead, I was hunkered down in our basement with a bicycle helmet on and checking Facebook for local news/weather updates, updating family and watching the radar.